Who is the Best Bond?” Since then, we’ve had an interesting diversity of responses. Currently it looks like Roger Moore and Daniel Craig win out as favourites, but Sean Connery and Pierce Brosnan are close behind. If you haven’t yet joined in the Best Bond debate, then you might want to check out Sky Movies Modern Greats this month. Not only are they showing ten classic Bond movies for the next few weeks, but it’ll be the first time on UK television that you’ll able to see Connery with clarity, Craig with crispness, Brosnan with brilliance and, well, more of Moore. It’s Bond in high definition which is great for everyone lucky enough to have HD TV. Sadly I don’t, but I am lucky enough to have a 007 in my phone number… so there. 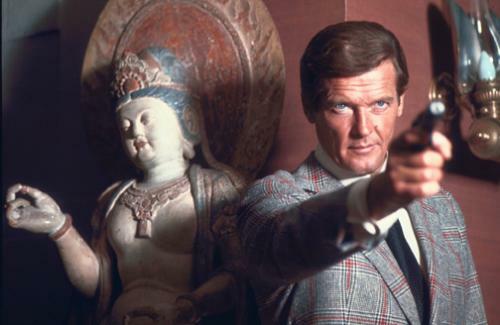 Anyway, because I much prefer comedy to action, I personally think that Roger Moore is the best James Bond, and that’s why I’ve chosen today’s film (although unfortunately it’s not the best of Moore’s Bond appearances). Ah well, you have to watch them all don’t you if you’re a fan. From Russia With Love is also on today at 8pm. Which do you think is the quintessential Bond signature song? For me, the best has to be Shirley Bassey’s theatrical Goldfinger.